Editors note: New customers at Betfred in 2019 can get 50 free spins when they spend £10 on slots as a welcome bonus. The best thing about this offer? There are NO wagering requirements in place on winnings from free spins… whatever you win from them you can withdraw straight away if you want. Get stuck in! In spite of only working with those three companies, the Betfred Casino does offer one of the best selection of slot games around. There are, in fact, literally hundreds of games available and these include video slots, slots with all different types and numbers of reels and an impressive number of progressive jackpot options. As one of the providers the Betfred Casino does work with is Playtech, too, the company can also boasts some of the most popular slots around. These include the famous Frankie Dettori’s Magic Seven and a whole host of slots themed around Marvel characters and movies. Play slots at Betfred & spend £10 for 50 free spins! Betfred Casino run a welcome offer for brand new customers which is both easy to access and comparatively generous. Any new player who deposits at least £10 in their account and spends it on slots will get 50 free spins if they agree to the terms of the promotion. Head to Betfred.com/casino on your PC, laptop or mobile device. Tap or click the green ‘Sign Up Now’ button located in the top right hand corner of the page. You will then be taken to a registration form where you need to fill in the requested details and then select the green ‘Register’ button. 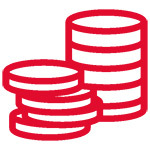 Make your first deposit, ensuring that it is worth at least £10. Select the ‘agree/accept’ option on the pop-up which will then appear, to claim the bonus. 50 free spins will be added to your account. Stake £10 and get your 50 free spins bonus! <New customers only, 18+, T&C's apply. The bonus is limited to only brand new Betfred customers who have never before received a welcome bonus from the company. The offer cannot be claim in conjunction with any other promotions. In order to be eligible for the promotion, a customer’s first deposit to their Betfred Casino account must be worth at least £10. For bonus funds to be credited, a customer must agree to and accept the offer’s terms and conditions when prompted to do so. If their initial deposit is worth at least £10, they accept the promotions’ terms, and spend the £10 on slots the bonus will be credited within 48 hours. Any winnings from the free spins themselves are not subject to any wagering requirements and can be withdrawn straight away. Once triggered free spins are valid for a total of 7 days before they expire. Customers have 7 days from sign up to wager their £10 to release the free spins. To release free spins the £10 spent must be across five or more game rounds. Each free spin will be to the value of 1p per line and all lines of the slot machine will be activated per spin. Free spins can only be used on selected slot games – see full terms for details on the Betfred website using the link below. The bonus terms must be accepted within three days of a deposit being made. The promotion is not offered to residents of the following countries; Greece, Bulgaria, China, Spain, Estonia, Israel, Japan, Netherland Antilles, Philippines, Thailand, India, Pakistan and USA. For full T&C’s please go to the Betfred casino now. *One free bank transfer per month, additional transfers charged at £12 each. **Neteller deposits are free as long as you play through your deposit amount at least once over. Betfred casino have decide to head down the web browser route for their mobile offering. That means that no matter what kind of device they use, a mobile customers need only visit the company’s site via their web browser and they will benefit from use of the Betfred Casino mobile site. 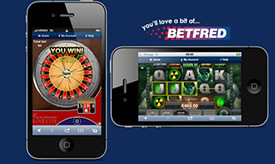 As soon as they do access the mobile version of the Betfred Casino site, a player will be struck by its attractive look. What’s more, you only need to use the site for a few moments to be impressed by how user-friendly and easy to navigate it is. Beyond that, too, the fact that a number of live dealer casino game options are available as part of the mobile site is a distinct advantage over a number of other similar sites. In fact, the overall number of different services that can be swiftly accessed via the Betfred mobile site is impressive. That is, if you’re a fan of sports betting, bingo and poker as well as casino games, given that the Betfred mobile offering is a combined site providing all of their different services in one place. If you’re purely interested in playing casino games, the fact that Betfred does not offer a dedicated casino app can, of course, also be seen as a weakness. You do, after all, have to navigate through or past sportsbook and other options to access the casino games you wish to play. What will also disappoint some players, is the fact that the number of games which are provided for is a little disappointing. The Betfred Casino games offered on mobile are far less numerous than both those offered through their own desktop site and by some competitors’ mobile apps. No live chat is available through the Betfred mobile site, either, which limits a mobile player’s options when it comes to customer support. Get app & spend £10 on slots for 50 free spins! If a Betfred Casino customer has a question about the company’s service or runs across any problem whilst using it, there are a variety of different ways in which they can seek a solution. Firstly, the Betfred website features a comprehensive help section which can be easily accessed from any page by one simple click. That help centre caters to customers using Betfred’s sportsbook, poker client and bingo offering as well as Betfred Casino players, and is populated with loads of helpful information. That information includes an in-depth betting glossary and frequently asked questions encompassing topics as diverse as system requirements, game options, technical problems and others. The centre, however, does not boast a search feature so it can take a little time to find an answer to one specific question. If browsing through that help centre isn’t the way they wish to go, a Betfred Casino customer can also contact the company’s customer service staff 24 hours a day and seven days a week. A live chat feature is included on Betfred Casino’s desktop site and there are also continually available helpline numbers provided for both the UK and the rest of the world. Email enquiries are also welcomed via support@betfredcasino.com and postal queries or complaints can be sent to Petfre Limited (Gibraltar), Unit 5.2, Waterport Place, 2 Europort Avenue, Gibraltar. Petfre (Gibraltar) Limited, trading as Betfred, are licensed and regulated by the Great Britain Gambling Commission with license number 39544. Unlike many other companies, that is the extent of Betfred’s licensing, and they are not also licensed by the Gibraltar government. The company is, however, still incorporated in Gibraltar and has a registered office at the following address; 5/2 Waterport Place, Gibraltar. As well as being regulated and overseen by the Great Britain Gambling Commission to ensure fairness of practice, Betfred Casino also has all of its cyber security bases covered. Any transactions or data transfers through their site benefit from the industry standard 128 bit encryption to ensure safety. The Betfred Casino service is one which will make the vast majority of customers happy and which boasts a number of notable positive features. The company’s welcome bonus is reasonably generous, their selection of games is certainly decent and their mobile offering is by no means the worst around. There are few areas, however, where the Betfred Casino really excels. It welcome bonus, for instance, is generous in that it offers 50 free spins with NO WAGERING REQUIREMENTS on winnings from the free spins and you trigger these by spending only £10 on slots when you sign up. Great if you’re a slots player… not so great if you’re not. The selection of games, too, compares well with other providers when it comes to the desktop site but does fall away a little for mobile customers. Providing just one mobile site for all of the company’s clients rather than a dedicated casino offering, too, is a little disappointing. Get 50 free spins when you spend £10!